On March 18, 2009, the Chinese Commerce Ministry rejected Coca-Cola’s proposal to take over Huiyuan, the top juice maker in China. This deal was a closely watched one as an early test of China’s newly instated anti-monopoly law. The veto was greeted with dismay in the major western media and widely interpreted as a new signal of Chinese protectionism. The article in the Times and the editorial by Financial Times suggested that the Chinese government made decisions based on nationalistic considerations, rather than any sound economic or legal rationale. The rejection is thought to have far-reaching ramifications for foreign investment in China and Chinese acquisitions abroad. I do not know how far-reaching the ownership of a bottle of juice can be. But secretly, I am glad about the collapse of this deal. Let me explain. I have been living in America since 1989. But in 2000, I spent one year on sabbatical in Beijing with my six- and one-year-old children. One of my biggest challenges was to find a drink to suit their made-in-America tastes. This was especially a problem for the six-year-old since he had keen tastes and was uncompromising. Soda was out, as he had never touched it. It took me a frustrating month to find the right milk brand for him after what seemed an endless trail. Fortunately, juice was not a problem as he accepted Huiyuan apple juice on the first try. It was a big relief since apple juice is not a traditional Chinese drink, and I was not sure I could find it. Most supermarkets did have a few foreign brands of apple juice on the shelf, but they were pricey, based on their dollar value in America or New Zealand. While my income was from America, I could not bring myself to spend 30 yuan for a bottle of juice. As far as I could tell, one yuan in China could buy about $1 worth of goods in America at that time. Would I ever consider spending $30 for a bottle of apple juice in America? Huiyuan apple juice had a clear and refreshing taste with a lower sugar content than comparable brands in America, at only a fraction of the cost. I was grateful that this new Beijing company was providing my kids with the comfort and sweetness of America, and it was also a connection to the local apples of my childhood in Beijing. I have visited China several times since 2000. Huiyuan was always the reliable and inexpensive local juice to sate my kids’ sugar thirst. 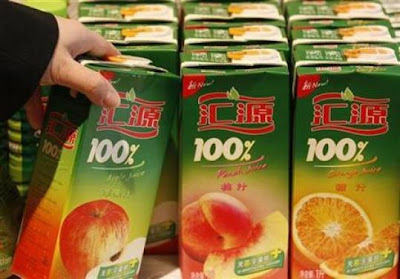 I have to say that I was not particularly excited to hear that Coca-Cola wanted to acquire Huiyuan—by now a national company with almost half the juice market share in China. We never drink Coke or Pepsi in my home and I have cut down my kids’ juice consumption because of the high sugar content, so the fizzy drink giant has never enjoyed much of a buzz in my household. I cannot imagine that Huiyuan would taste better if Coca-Cola were the owner (though I can see that a merger might bring better profits). I am afraid that it might become more loaded with sugar, or core syrup for that matter, or become more expensive. I suspect that Chinese consumers agreed with me when they heard about the proposed merger. This is why, in an unscientific on-line poll, over 80 percent voted “no” to Coke’s acquisition. Most media outlets characterized the Chinese attitude as nationalistic. But no one bothered to ask what motivated that “nationalism.” After all, the Chinese can hardly be said to be against globalization. You cannot live in Beijing without using brand names from around the world. So why the insistence on keeping Huiyuan domestic? It would be helpful to know a bit more about Chinese consumers. Most Chinese consumers, with the exception of those younger than 20, remember a time when there was very little choice in consumer brands. Everyone used the same things: “Arctic” (北冰洋) soda, “Forever” (永久) and “Flying Pigeon”（飞鸽 ) bicycles, “White Cat”（白猫) detergent, “Zhonghua”（中华）toothpaste, “Beauty and Clean” (美加净) face cream, “Nanfu” (南孚) batteries, and so on. Some of these products were made by state-owned companies and they looked the same decade after decade. Others were made by emerging private companies. Huiyuan is the latter kind. None of these products were fancy, but they were reliable and inexpensive. In the 1990s, many of these companies were short of capital to compete with growing foreign brands. Some simply disappeared. Others were restructured with the injection of foreign capital. It was thought that only foreign capital with better management and higher quality could modernize these old companies. Everyone supported such a move and some local governments were so eager that they forced their enterprises to accept foreign investment. At the time, no one thought much about the value of these well-known brands, even though they might have had the largest loyal consumer base in the world. Restructuring, however, brought almost none of these Chinese brands back. They either completely disappeared or became marginalized, only showing up in country stores. Nowadays, Chinese consumers drink bottled water from Kang Shifu (康师傅, Taiwan), use P&G (宝洁) and J& J for household cleaning, drink Coke and ride “Giant” bicycles. The well-off use Japanese, European or American beauty products for skin care. Meanwhile, the simple, dependable and affordable merchandise of once common Chinese brands, sentimentally tied to the childhood of several generations of Chinese consumers, vanished. Around the early 2000s the Chinese government realized that it would be good for Chinese companies to have brand-name recognition, but by then most long-established brands were nowhere to be found or had lost their toehold in the mainstream market. With only a small number of local brands around, the few successful ones, such as Huiyuan, became especially precious. This explains the 80 percent “no” vote. Now, lawyers and consultants are indignant about the failed Coke-Huiyuan marriage. I am sure that each side will come up with legal explanations for the wisdom (or lack thereof) of this decision and its far-reaching ramifications. It is also true that for the average consumer changes in ownership may not bring much of a difference—whether Huiyuan is owned by the Chinese or by foreigners. But, as for me, I am glad that Huiyuan remains a Chinese company. It is not because I worry that China could not develop into a superpower without its own juice company, though. I have a hunch that by continuing as a Chinese company, Huiyuan would have to remain devoted to its Chinese consumers, and would develop unique products suited to their tastes and purchasing power. Being a subsidiary of Coke, however, might reduce Huiyuan’s commitment to local particularities. I could be wrong. But I happen to think that the world needs such a great variety of drinks at different price ranges that it might not fit the bottom lines of the two soda giants to provide for them all. Yu Zhou is professor of geography at Vassar College and author of The Inside Story of China’s High-Tech Industry: Making Silicon Valley in Beijing. I am an American living in China, and I had the exact same initial reaction when I heard Coke was trying to buy Huiyuan. While legally, I probably agree that Coke should have been allowed to buy the company, I was personally glad they weren't. I'm also a big fan of Huiyuan juices because they are healthy and delicious, and I was also worried what they would do to the juice. The idea that Huiyuan is one of a few 'precious' local brands is, frankly, ridiculous. There are literally hundreds, if not thousands, of local brands that still do very well, many of them outright category leaders (for example beer, sport retail and milk, off the top of my head). They are not going away and many are even expanding overseas. International brands are, save one or two categories, still bit part players in the China market. And Jen, do you really think Coke would buy a hugely successful market leader and then change the winning formula? I disagree with your analysis. As the soft drink market is relatively flat (pun intended) worldwide, Coke needs other markets to show growth. Juice, an area that Coke has very little market share, provides them an excellent opportunity. I don't see Coke changing the brand or the formulation, as they don't tamper with Minute Maid orange juice. The sale was blocked for political reasons, not market reasons as Coke has nearly zero share of the juice market so does not fall under monopolistic practices. I also have to confess my fondness for this brand. The appearance, finally, of affordable, 100% fruit juice on the shelves in the tier-2 city I was living in was one of those quality of life improvements that don't seem terribly consequential in hindsight but were pretty significant to me at the time. That said, Anonymous above might have a point about monopolistic behavior. Nowadays Great Lakes brand OJ tastes better to me, has pulp, and at 40-something RMB for two 2L bottles you can't beat the price. This is a great blog of yours, Your site is very informative and I can relate to your posts. My husband and I are also EXPATs in China. I have just started my own blog: TheShanghaiExpat. Please feel free to visit and let me know what you think for a link exchange. If there is one kind of fruit (guo) and two juices (zhi) is this "iguo liangzhi"?